The VeriFone VX 510 Dual Modem credit card terminal offers extraordinary performance for payment and value-added applications — and it dramatically reduces transaction time to just a few seconds. The Vx 510 Dual Modem offers a choice of two connectivity options: Ethernet and dial. The dual communications options allow built-in dial capability to be used today, then switched to Ethernet at any time. Merchants with existing broadband service can immediately process payments. It’s simple, reliable and future-proof. The Vx 510 Dual Modem is a hard-working, reliable payment device that will earn its keep, day after day. The Vx 510 Dual Modem makes quick work of debit and credit transactions. The VX510 Dual Modem has an ATM-style interface that’s instantly intuitive for even your newest hires. The integrated thermal printer – with trouble-free, drop-in paper loading – and a built-in PCI PED approved PIN pad keep your countertops clutter-free. 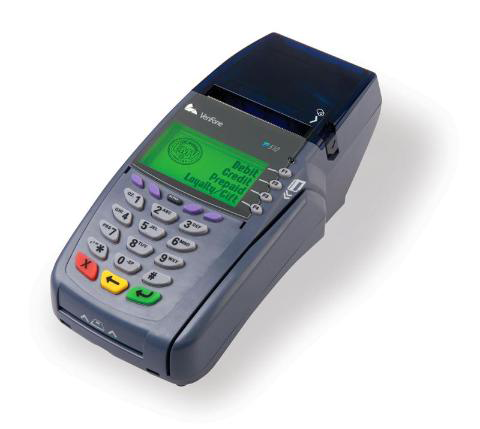 Plus, the lightweight, ergonomic device can be easily handed to customers for PIN entry.